Wader Quest: NBROT comes to a bone crunching standstill! NBROT comes to a bone crunching standstill! Andrew Whitelee has been valiantly ploughing down the east coast of Scotland and England on his bike in order to raise funds for two charities; Wader Quest and Bird Observatories Council. He has battled the elements, diversions, rotten signage, punctures, a buckled wheel and closed bridges, all of which he overcame with fortitude and a cheerful smile. Sadly all this was brought to a sudden end by a car careering into the back of his bike in a cycle lane! Andrew’s bike was thrown forward and he was jettisoned from it. He flew through the air, struck a bollard on the way down and ended up spread-eagled on the pavement, the car, a 4x4, drove on as though nothing had happened. Andrew was understandably shaken and in a lot of pain so he didn’t continue with his journey that day although the bike was intact. He instead took a hotel room for the night (he quite reasonably didn’t fancy the hard ground in a tent that night). We urged him to seek medical advice and the following day he did just that and was advised that he should not continue with the journey for at least a week! His injuries were described as bruised ribs and hyper extended shoulder joint causing ligament damage; but it could so easily have been much worse. Andrew though is a doughty soul and has pledged to carry on after a short convalescence. This means that he will pick up the journey further south and continue to the finishing line, as planned, in Cley in Norfolk on the 29th of October. We will announce the restart point in due course and hope to be there this time to see him off and maybe support him to the finish line. We hope that maybe some will be able to come and wish him well and show their support when he restarts and/or greet him when he reaches Cley. 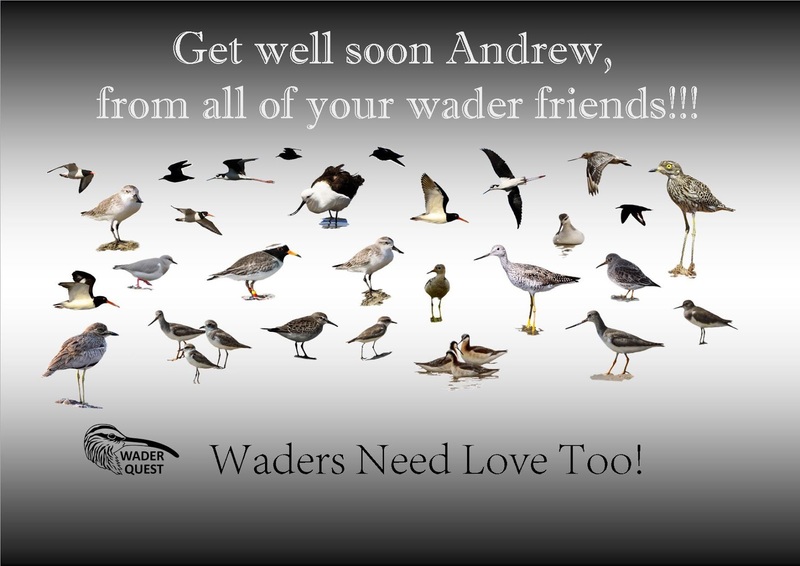 Andrew is naturally distraught and now feels that he is letting everyone down, but he is not, we can honestly say he is not letting Wader Quest down in any way; we appreciate what he has already achieved and if he decided to stop now, we would be more than delighted with the result (notwithstanding the terrible circumstances of this accident of course). We hope that this set-back will not put people off supporting him, indeed we hope it will make people more determined to demonstrate to Andrew that he has no reason to feel anything but pride for the selfless effort he has already put in. Make Andrew proud and help him achieve his fundraising goal, not for our sake, but for his.